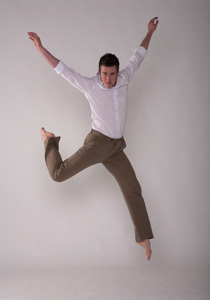 Sean Dorsey Dance | Free Dance & Self-Expression Workshop for LGBT People & Allies! This free and super-friendly workshop is led by trailblazing transgender choreographer Sean Dorsey from San Francisco along with his Company dancers – and will include conversation, cookies and intro/beginner movement/dance. Please join us! THIS FREE CLASS IS PART OF SEAN DORSEY DANCE’S TOUR TO L.A. — we are performing our show “The Secret History Of Love” on SAT AUG 4 @ 8:30pm and SUN AUG 5 @ 7:00pm. Info: www.seandorseydance.com. * Sean’s company Sean Dorsey Dance is performing their powerful show about LGBT love and history (The Secret History Of Love) this same weekend (Aug 4 & 5: www.highwaysperformance.org). * Sean will talk about his experience and history as a transperson, how he decided to become a dancer, being the director of a transgender arts nonprofit, and how his unique fusion of dance, storytelling and theater is creating space for transgender and queer bodies and stories in dance. * Sean and his company dancers will lead us through some basic stretching and dance movement. No experience necessary! This will be super-friendly, non-judgmental, and for ALL levels, including TOTAL beginners! * We know that transgender and gender-variant people don’t generally feel welcome, safe or comfortable in dance studios or classes…so please know this is truly going to be a super-friendly environment! * Wear anything that you’re comfortable in – and that you can move around in. Sweatpants, shorts, loose pants, baggy jeans. There will be no touch involved at all, and you can change privately in gender-neutral bathrooms. There will be snacks too!